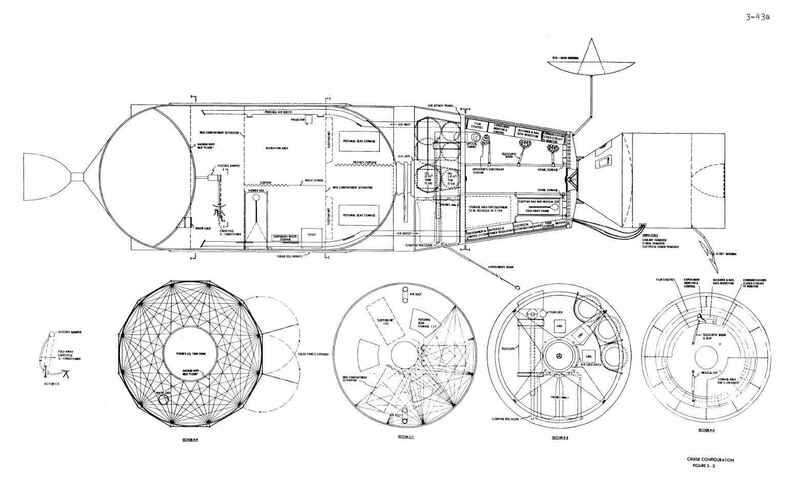 A cutaway view of the Manned Venus Flyby spacecraft. Based on Apollo hardware, this remarkable proposal would have sent three astronauts on a year-long mission to Venus and back. Public domain image from the 1967 NASA document Manned Venus Flyby, via Wikimedia Commons. Click for a larger version. What it was: A proposed post-Moon landing manned mission using Apollo hardware. It would have launched during a good alignment of Earth and Venus in November 1973 and taken three astronauts on a flyby of the planet Venus, returning to the Earth 13 months after launch. 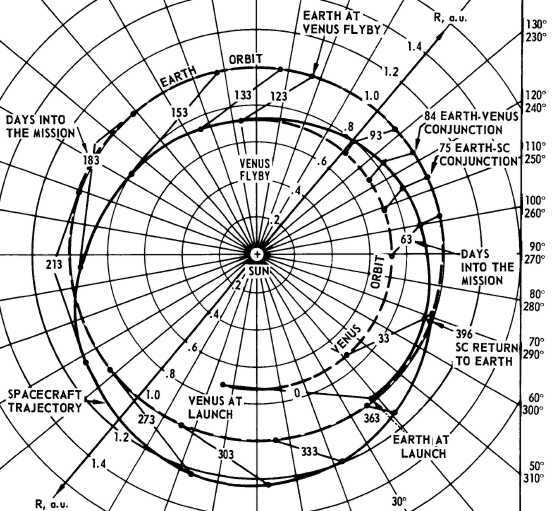 A later variation of the mission ambitiously suggested using a better conjunction in 1977 to visit Venus and Mars on an outbound leg and Venus again on the Earth-return leg, however most of the work done considered the shorter Venus flyby. Details: By the mid-1960s NASA was well aware that if they successfully completed the Apollo moon landings they would probably face a severe decline in budget for the manned space program. In the hopes of proving their ongoing worth they developed a few different post-Apollo proposals using evolutionary versions of the Apollo hardware, including plans for a manned lunar base, space stations, and planetary exploration. The latter two of these goals were at first grouped under the name Apollo X, and then became the Apollo Applications Program (AAP). By far the most ambitious of the AAP missions was a manned flyby of the planet Venus. After two preliminary missions in Earth orbit to test the technology, a Saturn V launch would lift an Apollo Command Module into orbit. As in a typical mission, the first two stages of the rocket would be jettisoned. However the uppermost stage, the Saturn IVB, would be kept and drained of any remaining propellant. Using gear stored where the Lunar Landing Module would have been placed in a Moon mission, the astronauts would then rig it as a habitation module. The resulting 33-meter-long spacecraft would leave Earth orbit on October 31, 1973 and travel towards Venus for 123 days. There would be a flyby on March 3, 1974. The craft would have been aimed to pass Venus as close as 6200 kilometers above the surface (one planet radius) very quickly—orbital mechanics would have it moving relative to Venus at a clip of 16,500 kilometers per hour—crossing the lit side of the planet. A sidescan radar would map the portion of the planet they could see as they flew by, and the astronauts would perform spectroscopic and photographic studies. Six atmospheric probes, which would enter the atmosphere at six locations: the planet’s solar and anti-solar points, its terminator and equator, and the middle of the light and dark sides. They would drop in ballistically and try to determine how Venus’ atmosphere increased in density the closer one got to the surface. Four meteorological balloon probes. They would float in the atmosphere and try to learn how the Venusian atmosphere circulated as well as study smaller-scale winds. Two “crash-landing” probes that would try to photograph the surface on the way down, much like Rangers 7, 8, and 9 did with the Moon. Two soft-landers that would take surface photographs, examine the soil, and measure Venusian weather. As well as acting as a communications hub, the orbiter would use X-band radar to map the planet. The MVF’s trajectory. Detail from Manned Venus Flyby. Click for a larger view. After that burst of activity the MVF craft would then return home, taking 273 days more to loop out to 1.24 AU from the Sun on a hyperbolic trajectory and eventually swing back to Earth. The astronauts’ landing on Earth would happen on December 1, 1974—total mission time would be 396 days. The Triple Flyby variant would have taken more than 800 days starting in 1977. When not at Venus, the MVF astronauts would have studied the Sun and solar wind as well as making observations of Mercury, which would be only 0.3 AU away two weeks after the Venus flyby. To keep them occupied otherwise their habitation capsule would have been outfitted with a small movie screen (to show 2 kilograms of movies allowed), and a “viscous damper exercycle/g-conditioner”. The crew would also be allowed 1.5 kilograms of recorded music, 1 kilogram of games, and 9 kilograms of reading material. Hopefully they would choose wisely. What happened to make it fail: The MVF was part of the Apollo Applications Program, and the AAP was killed dead on August 16, 1968 when the House of Representatives voted to cut its funding from US$455 million to US$122 million. President Johnson accepted this as part of a larger budget deal that kept NASA’s near-term goals safe, though even at that the agency’s entire budget dropped by 18% between 1968 and 1969. The only AAP mission to survive was Skylab. What was necessary for it to succeed: It’s tough to get this one to work as it’s difficult to see any advantage to sending people on this mission. Mariner 5 had already flown by Venus in 1967 and NASA was able to send a robotic orbiter as part of the Pioneer 12 mission in 1978, just a few years after MVF would have flown. Even the many probes that the MVF would leave behind at Venus had no obvious connection to the manned part of the mission; it would have been easier to send an unmanned bus of similar size and drop the probes that way. There would be no need then for heavy food, water, or air, or the space for people to move around. And unlike the manned mission there would be no need to bring the bus back, greatly reducing the mission’s difficulty. About all the manned mission had going for it was an opportunity to see what kind of effect a year in microgravity would have on humans, and that could just as easily be determined using a space station in low Earth orbit. On that basis we also need to be aware that Congress asked hard questions about the purpose of NASA’s manned Mars mission plans in the late 1960s and were hostile to all of them. If Mars wasn’t going to get any money, it’s hard to see what could influence them to fund a mission to Venus. Finally it needs to be pointed out that no matter even if the MVF launched, nature itself probably had this mission’s number. We didn’t have a very good understanding of the Sun at that time, having only observed one solar cycle from above the atmosphere when the flyby was proposed in 1967. While the launch window was deliberately chosen to be near a solar minimum, and the flyby craft was to have a radiation lifeboat in the equipment module, the mission would have run into an unforeseen natural event on the way back to Earth. The saving grace here is that coronal mass ejections were discovered in 1971, so the initial plan probably would have been called off rather than risk casualties, or at least be reconfigured to give the astronauts the protection the 1967 plan failed to give them. An interesting simulation (using the program Orbiter) of how the MVF mission would have run can be seen on YouTube. This entry was posted in Sputnik to Moon Era and tagged apollo applications program, apollo moon landings, apollo variant, flyby spacecraft, manned space programs, saturn v variant, space capsule, stopped with labwork, united states, venus flyby by Paul Drye. Bookmark the permalink. Getting the probes down isn’t all that challenging – automated rockets had done much the same thing, after all – and it seems to me that the orbiter is the only real rocket engineering (as opposed to life-support) difficulty here; it’s the thing that has to shed energy down to where it can remain near Venus. As you point out, there’s nothing in particular for the humans to do. Then again, I think much of the AAP was a desperate scrabble for cash, with anything that sounded good included in the hope that it might catch some senator’s eye. Aa for justifications for the mission, yeah, it would have been infinitely preferable and more economic to launch an unmanned rowboat to the west in 1492 rather than 3 manned sailing ships. When it hit shore it could have dropped a message in a bottle returning valuable scientific data. The point being, pushing man’s boundaries is justification for itself. The chimera of “scientific value” has had us trapped in LEO for nearly 50 years because of just this kind of materialist, reductivist reasoning. We’d have an infinitely more accomplished space program in its most valuable sense – extending man’s frontiers leading to decreased dependence on this island Earth – under historic funding profiles, had the AAP gone forward. We’d likely have been to Mars by now, or at least had decades experience living on another celestial body in preparation for manned Mars exploration/colonization. No, in 1492 automated technology was too primitive to accomplish much. An unmanned rowboat would have run aground or sunk a few miles after launch, I would expect. Was a joke. Exaggeration for effect. Was joke back, pointing out the exaggeration. It is. But the risks have to justify the probable benefits of pushing those boundaries. There are many things we can (and I do) regret did not come about with Apollo and Apollo Applications. But the Manned Venus Flyby really is not one of them. It was simply a bridge too far given the available technology and state of knowledge regarding solar radiation threats in the early 1970’s. The scientific return from any likely Venus robotic probe in the same time frame would have been similar and perhaps superior, without any of the attendant risk to human life. A reasonable risk assessment should have dictated cislunar space as the outer acceptable boundary for manned exploration in the 1970’s. And even that risk would have been considerable. A continued, aggressive lunar program (moving up through ALSS, AES, and LESA) would have had a strong likelihood of a loss of crew at some point if sustained through the 70’s, but that would be a factor of frequency – roll the dice enough times and eventually you’ll roll snake eyes. Whereas a Venus mission would have likely been a bad dice roll on the first try, even without the coronal mass ejection of ’74. And yet we lost 2 much larger crews going and from LEO flying a badly compromised (and wholly oversold) design. I get your point. But did the Spaniards suffer heart-wrenching indecision over the loss of a ship to the New World? I guess the broader point is, have the challenge and difficulties changed, or have we? And a caveat of that would be the inveterate tendency of bureaucracies to play it safe. NASA in the 60s achieved incredible things, but institutional inertia, careerism, and a desire to play it safe and not rock the boat set in quickly. But even doing that people still died. Whether many more would have died in a more aggressive program is entirely arguable. Then again, it ain’t my life, or that of my friends, on the line. And way to track me down? You stalking me?